In November I received €155,54 in dividend payments. Previous year in November I received €40,74 so my dividend income is up 282%. Besides my monthly deposit to my stock account I also repayed €500 extra towards my mortgage principal. As I only pay 1,99% interest this will not result in a big interest saving next year, but I enjoy the feeling that I won’t have a mortgage anymore within a few years. This month I received payments from 7 companies. Macquarie Infrastructure Company, Omega Healthcare, AbbVie and Simon Property Group are responisble for over 80% of my dividend income this month. This month the share prices were down a lot due to trade war fears. My China-Tech related exposure increased by purchasing Alibaba and Tencent. Also I bought 112 shares Royal Dutch Shell at the end of the month, because Royal Dutch is down over 10% since its top and I consider the dividend yield of 5,6% a decent level to buy. Only one more month and another year has finished. I expect to realise all targets set for 2018. In the first weeks of December I will set my targets for next year. In October I received €78,36 in dividend payments. Last year in October I received €25,79 so my dividend income is up 203%. I only have 5 stocks in my portfolio paying dividend in October. 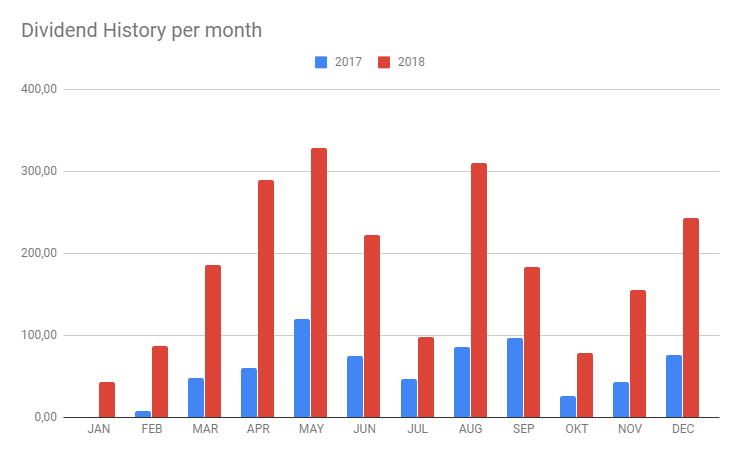 So October is never a big dividend income month for me. Wereldhave, Coresite Realty and Coca Cola are over 80% of my dividend income this month. It’s possible that I will slightly reduce my Royal Dutch Shell position if the shares are above €30. Last few years I purchased a few times Royal Dutch Shell around €25 to sell it above €30. Shell is one of the few companies in which I sometimes open a ‘trade’ position. While waiting for the price to increase I enjoy the dividend and above €30 I sell (part) of the shares. The month I ended with a portfolio value of €59.781. So I’m down 4,6% this month. My estimated dividend income for 2018 based on my current portfolio is €2.202. The yearly estimated dividend income of my current portfolio is €2.655. In September I received €183,36 in dividend payments. Last year in September I received €90,26 so my dividend income is up 103%. I received dividend payments of 12 companies. Royal Dutch Shell (RDSA), Enbridge (ENB) and Dominion Energy (D) are responsible for over 50% of my dividend income this month. 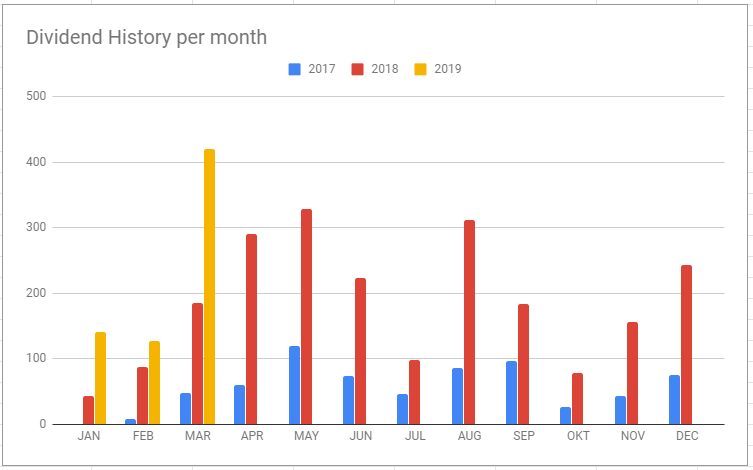 This month I did make 4 purchases: 6 shares of Spanish airport operator Aena, 4 shares of technology company ASML Holding, 150 shares of Insurance company Aegon and 50 shares of the Dutch Bank ING Group. All 3 of these companies I already have in my portfolio so I increased the number of shares I own in them. All 100 shares of Kas Bank I sold this month, because they reported disappointing results and I consider the outlook also not possitive for Kas Bank. Therefore I decided to sell the shares and invest the money from the sell in Aegon shares. The month I ended with a portfolio value of €61.683. My estimated dividend income for 2018 based on my current portfolio is €2.163. The yearly estimated dividend income of my current portfolio is €2.442. In this post I will make an analysis of the diversification by country of my share portfolio. 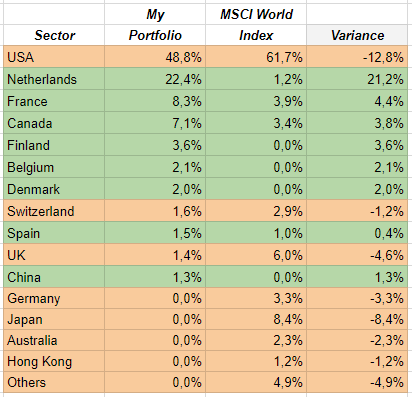 I will compare my diversification by country with the MSCI World Index just as when I made an analysis of the diversification per sector of my portfolio. Shares from The Netherlands are 22,4% of my portfolio. In the MSCI World Index The Netherlands is 1,2%. The Netherlands is my home country so it’s easy for me to get enough information about Dutch companies and decide if I consider them good potential investments. The Netherlands is also the home country for many international companies. I have Royal Dutch Shell, ASML Lithography, Unilever and Aegon in my portfolio listed as companies from The Netherlands, but the majority of their income comes from other countries than The Netherlands. Also I have the Think AEX ETF in my portfolio. This EFT is fully invested in Dutch stocks. I don’t mind being overinvested in The Netherlands, but now I compared the share of Dutch stocks in my portfolio versus the MSCI World Index, I think I should reduce the share of Dutch stocks in my portfolio. I could sell the ETF and refrain from investments in Dutch stocks until I consider the share more in balance. The USA is 48,8% versus 61,7% in my portfolio. I always had the idea that I’m overweighted in the USA and decided to mainly buy euro stocks for the last months of 2018, but compared with the MSCI World Index I’m underweighted. I guess this is mainly the result of being overweighted in The Netherlands. The positive thing of this analysis is that I have a decent number of American companies high on my watchlist. The devil in my head saying that I’m overweighted in USA and that I should buy euro stocks I now silenced by looking at the MSCI World Index. I don’t have any stocks from Japan and Japan forms 8,4% of the MSCI World Index. I don’t see myself buying any Japanese stocks anytime soon. I simply don’t have enough knowledge to pick quality Japanese stocks. Softbank is top of mind as a big investor in Tech companies, but having just one company top of mind is not a solid basis to my investment decissions. I probably take it for granted that I’m not invested in Japan. For the next year I will focus on slowly reducing the exposure in The Netherlands and I will add some more American stocks. 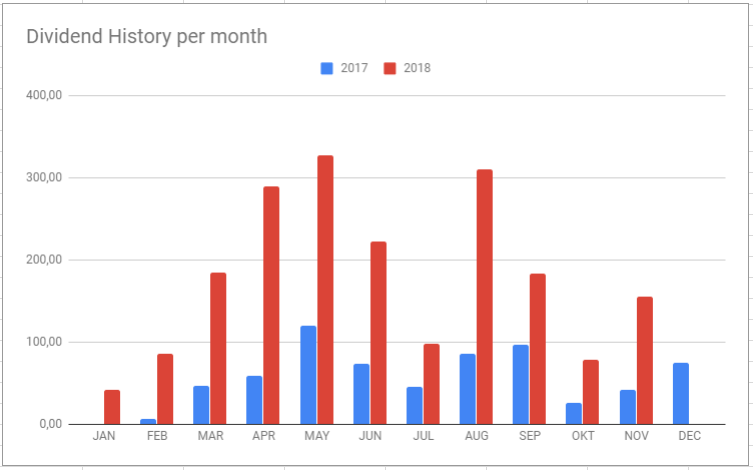 August was an unexpectingly strong month for me with a dividend income of €310,93. My dividend income of August 2017 was €76,53 so my dividend income is up 306%. I’m very happy with this result. The dividend income is much higher than I expected due to the dividend payment of Flow Traders of €67,50. Flow Traders is a market maker and it did benefit a lot of the volatility in the market in Q1. This resulted in a big profit and a big dividend. Volatility is gone so I expect this was a one time extra high dividend. Due to this high dividend payment of Flow Traders it’s now possible I will reach the dividend income target of €2.200 I did set for this year. Based on the stocks I own and the dividend payments they have scheduled for the rest of the year I’m now expecting an dividend income this year of €2.193. I just need a few more dividend increases combined with possible dividend income from stock purchases I will make this year and I’m at the target. Still not sure I will reach the target, but at least it’s going to be very very close. In August I recieved dividend payments of 13 companies. Mainly responsible for the dividend growth are new positions in Flow Traders and Omega Healthcare and also increased positions in National Grid, AbbVie, Macquarie Infrastructure Company and Simon Property Group. This month I bought 25 shares of Unilever at a price of €48,89 including fee’s. Unilever was already on my watchlist for a long time to buy on a dip, but the share price was mainly moving in a small range. I decided to buy this month defensive consumer goods company and I decided Unilever is my choice for this month. I ended the month with a portfolio value of €61.378. My estimated dividend income for 2018 based on my current portfolio is €2.193. The yearly estimated dividend income of my current portfolio is €2.386. I realized that I don’t have an idea how much my dividend income this year increased due to dividend changes from companies in which I own shares. I always adjust the dividend in my google docs file after I learn about a dividend increase or decrease, but I don’t have a total overview. – Only stocks are included which where in my portfolio at the end of 2017 which I now still own. – Stocks I bought in 2018 and had a dividend increase since opening the position this year are excluded. – I calculate the extra dividend income based on the number of shares I owned at the end of 2017. Macquarie Infrastructure Company (MIC) and Wereldhave were the only 2 companies in my portfolio reducing their dividend. In both cases I decided increasing the number of stocks I own after a stock price correction as a result of the communication of the dividend cut. MIC reduced dividend to internally fund the repurposing of a Tank Terminal after a client cancelled a contract. I considerred the selloff to big and decided and increased the number of shares MIC in 2018 from 7 to 42. Currently the yield is 8,7%. Wereldhave is did decide to cut the quarterly dividend from €0,77 to €0,63. I decided to increase the number of stocks I own from 20 to 55. I bought Wereldhave shares, because I considerred this stock undervalued. Wereldhave has issues with a shopping mall owned in Finland which results in negative valuation adjustments. After the stock correction due to the communication of the dividend cut I decided that I feel that the underlying assumptions I had when starting my position are not changed and bought more shares. Yield is now 7,9%. In total the dividend changes above are good for €68,36. When setting my target for this year of €2200 income I calculated with €76,80 in extra dividend due to dividend increases. This is 6% of the estimated yearly dividend income at the end of 2017. I’m around this number if I also take into account that some stocks I bought in the first part of 2018 also increased their dividend. 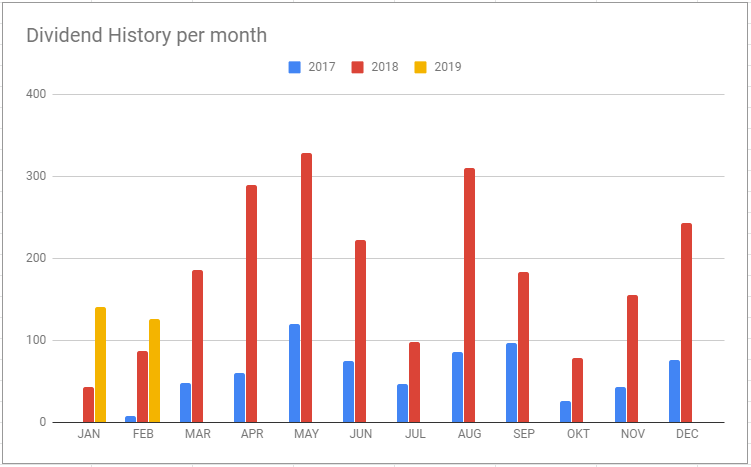 Starting 2019 I will track dividend changes in detail so I have more information available about the development of my dividend income, but for now I’m happy with 22 companies increasing their dividend. I have 6 stocks which normally tend to announce a dividend increase in the last quarter of the year so I’m looking forward to more dividend increases this year.